The BBC began broadcasting television programmes aimed specifically at children in 1946. These were broadcast under the catch-all title of For The Children and aired around 5 o'clock each day. Among the favourites was Annette Mills with the stories of her puppet friends including Muffin the Mule . An experiment in the Summer of 1950 saw a programme aimed at the pre-school audience at home with mother. Airing at the tail end of entertainment made for housewives, Andy Pandy was a puppet toddler who would encourage the real toddlers watching to join in his songs and dancing. The four trial films proved a success and more episodes were made and heavily repeated on successive Tuesday afternoons under the banner For The Very Young . Andy gained a second weekly airing on Thursdays in Summer 1952 but it was clear that more series for toddlers were needed. Andy Pandy was joined by Bill and Ben, the mischievous Flower Pot Men , in December 1952. At this time Head of Children's Programmes Freda Lingstrom hoped that Andy and The Flower Pot Men would be joined before long by more playmates in the new year (what happened to the Sugar Plum Fairy and two furry friends Diggle and Flick history doesn't tell) and hinted these programmes might well be aired under the new title Watch With Mother (taking its cue from radio's Listen With Mother, on the airwaves since 1950). It wasn't until 1953, with the expansion of programmes to three afternoons a week (Tuesdays, Wednesdays and Thursdays) that the Watch With Mother title finally came into use. The banner was intended to deflect fears that television might become a nursemaid to children and encourage 'bad mothering'. Later additions included Picture Book - illustrated storytelling - and Rag, Tag and Bobtail - the adventures of a hedgehog, mouse and rabbit. At last the service became daily with the first episode of The Woodentops on Friday 9 September 1955. The classic Watch With Mother line-up was now in place: Picture Book on Monday; Andy Pandy - Tuesday; The Flower Pot Men - Wednesday; Rag, Tag and Bobtail - Thursday; The Woodentops - Friday. This pattern would remain largely unchanged and be repeated countless times for a decade. 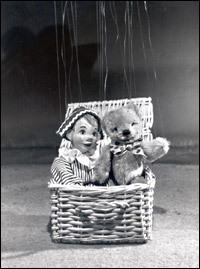 A new generation of series were ushered in with the 60s, including Tales of the Riverbank (live animals 'acting out' stories narrated by Johnny Morris ), Joe (a young boy's adventures in picture form) and yet more puppet/animated series such as Camberwick Green , Pogles' Wood , The Herbs and Bizzy Lizzy . The mid-60s saw a change in the broadcast pattern, with airings now at 10.30am, 1.30pm or sometimes both. With a colour television service imminent many of the series were now being made in colour with a view to future repeats. All of the Watch With Mother characters had been quite heavily merchandised since the 50s; the 60s saw the launch of Polystyle Publications' magazine Pippin , a junior companion to their TV Comic . The early 70s brought in such delights as Fingerbobs , Mary, Mungo and Midge , Mr Benn and the imported Barnaby but it also saw the end of the longstanding banner title. The use of the words Watch With Mother became increasingly rare in Radio Times through 1972 and by early 1973 had disappeared entirely. In the 70s, post-Women's Lib, the title seemed dated - many children watched at playgroup or with child-minders while mother went out to work. The pre-school slot continued nameless through the decade, firmly cemented in its post-lunchtime bunk - only the occasional use of a see-saw graphic device in Radio Times in Autumn 1977 tried to link the disparate programmes together. On 1 October 1980 the abstract title See-Saw was used for a double bill of King Rollo and Bric-a-Brac before quickly spreading to become an umbrella title for all series through the week. This strand would last well into the 80s. Programmes for young children now air throughout the day on BBC1 and BBC2 under the Cbeebies banner - the name also given to the BBC's all-day digital service for toddlers. Stories about Bill & Ben, who live in flowerpots and say "flobbadob"